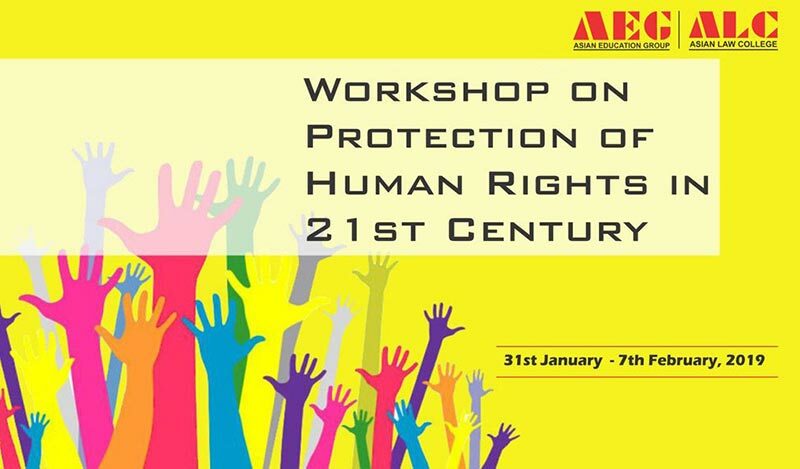 Asian Law College has organized a ‘Workshop On Protection of Human Rights in 21st Century’ at its campus in Noida from 31st January, 2019 to 7thFebruary, 2019. The chief guest for this event is Prof (Dr.) Manoj Kumar Sinha – Director, Indian Law Institute, and the distinguished speakers at this workshop are Dr. Nafees Ahmad – Assistant Professor, Faculty of Law, South Asian University, New Delhi and Prof (Dr.) Aftab Alam – Professor, Department of Political Science, Aligarh Muslim University. Without doubt, ‘Human Rights’ is perhaps one of the most important issues that confront human civilization in the contemporary point of history. And, here is an opportunity to get illumined on the same. The ‘Workshop On Protection of Human Rights in 21st Century’ has gone underway today, and all are cordially invited to attend the same and get enlightened on this all important issue of the modern times.